Malpatskitchen , in these 2 years, has successfully posted 378 recipes...... 5,30,000 Total page views all time-history, ........ 135 K followers and people who like my FB page!!! (this FB fan page was set up exactly 5 months ago)........... What more do I need?? Always, in our family, this halwa is made for Deepavali. My m-i-l's special recipe is being shared with you all with great pride..... Her's used to be the BEST halwa, I have ever tasted...same tradition and recipe continue.........only thing is, I have slightly reduced the quantity of sugar. Commercially, nowadays, cashews are also mixed with almonds to minimize the cost. When it is home-made,it is so pure. And, I haven't added any artificial food colors, which are hazardous for the throat, especially. The color what you see is the color given by the divine Saffron, in the fields of which Goddess is supposed to reside. Look at the perfect scooping consistency!!! Sugar - 2 1/4 cups(because the ground paste came to 1 1/2 cups) - ratio given below. 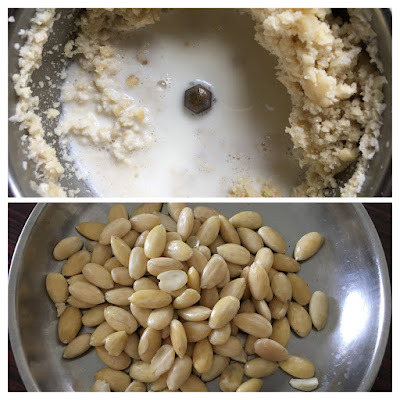 Soaked almonds, skins removed and ground with 1/4 to 1/2 cup milk to a coarse paste. There might be some not-properly ground small bits, which you may either remove or grind again. 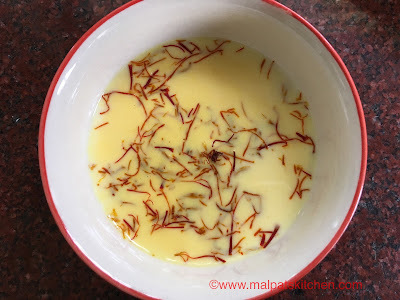 Saffron strands soaked in hot milk. Take a non stick kadai, put the ground paste in it, then add the saffron milk, sugar and cardamom powder, keep on slow fire, constant stirring is required. 10 minutes later, sugar will melt and it will look like this. Add some ghee now. 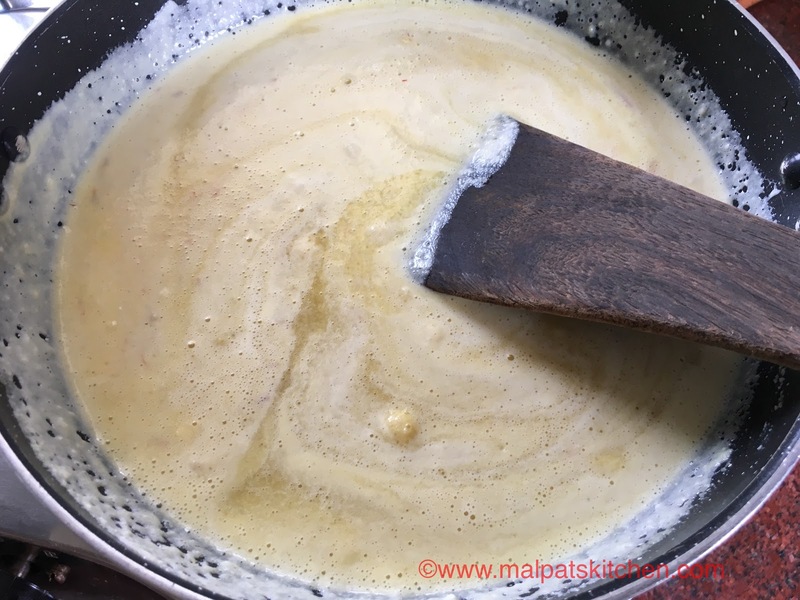 Ghee has to be added in small portions now and then. 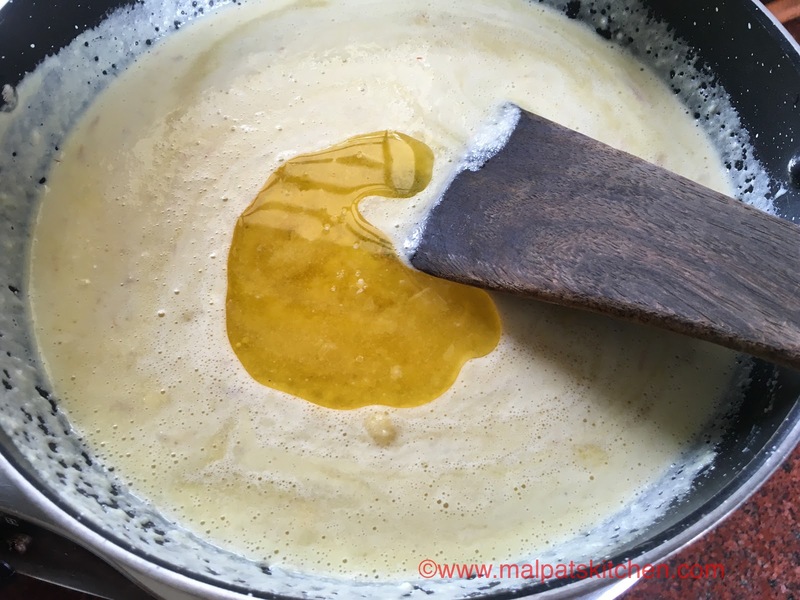 Do not try to reduce ghee. This amount is definitely needed to get this beautiful consistency. 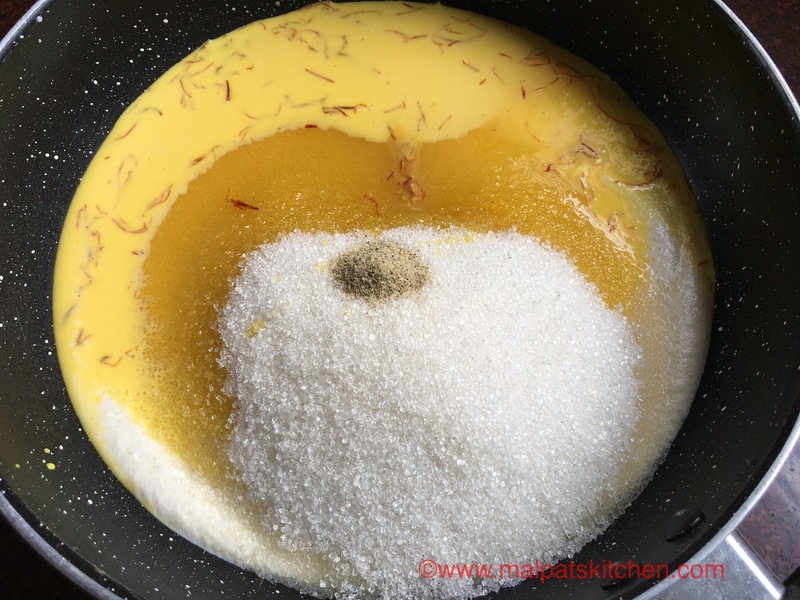 3 pictures below show different stages of the halwa. When it becomes white and frothy at the corners, exactly after 5-7 minutes switch off. By now, you would have used up the whole ghee. Allow it to cool down. * I also feel, making this in non stick pans is definitely a hassle free job. * It can never go wrong if you follow step wise. * Edible camphor can also be added, if you like it. Just a very teeny weeny pinch. Congrats Malpat on this fabulous blog and wonderful collection. We are so proud of your determined efforts and of course your hands which always seem to hold the golden spoon.